School of Information Studies Professor Emerita Marta Dosa passed away on Thursday, Jan. 8. She joined the faculty in 1962, after receiving her master’s degree in library science from Syracuse in 1957, and served for 34 years. She was 91 years old. At the iSchool, Dosa taught courses in international information policy, environmental information, gerontological information and government information. Her interdisciplinary approach to the field of library science appealed to a wide range of students, and helped to set the tone for the progressive spirit that endures at the iSchool today. Her courses on environmental information were among the first such courses offered in the discipline, and were taken by students not only in library sciences, but also in agriculture and forestry, public health, policy studies, law, education and public administration. 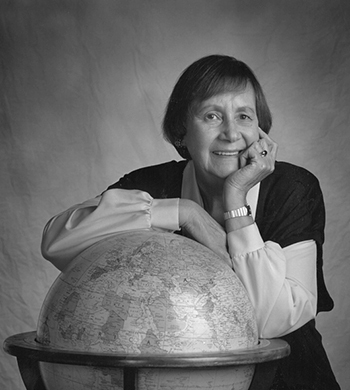 Dosa was responsible for bringing the power of information studies to students across the globe, and took an active role in international relations by broadening the school’s reach beyond the United States. Her travels to Central and South America, Indonesia, India, Malaysia and Africa for student recruitment enabled her to garner an international reputation that secured federal grants for graduate research study. She earned her undergraduate degree from the University of Budapest, and her Ph.D. from the University of Michigan in 1971. In 1974, she published “Libraries in the Political Scene,” a book that explored the concept of free and open access to information through the accounts of German librarian scholars living and working under repression—something she witnessed personally as a Hungarian refugee living in West Germany. In addition to her role at the iSchool, Dosa was an adjunct faculty member at SUNY’s College of Environmental Science and Forestry. She was a member of the Association for Information Science, the International Federation of Library Associations and Institutions and the Special Libraries Association (SLA), where she helped to establish the SLA’s Environmental Information Division. Dosa was active in the International Federation for Information and Documentation, the oldest international library organization, founded in 1895 to promote a unified and centralized approach to bibliographic classification. Inspired by her work, many former students have taken their research skills and degrees into diverse fields such as public service, environmental technology and public health. With her guidance, a number of these graduates have launched innovative library programs in nations around the world. In her tenure at the University, Dosa touched the lives of hundreds of students, many who fondly recall her teachings and attitudes toward the profession of librarianship. Marta’s research and teaching brought her close to dozens of current and former iSchool faculty members, who remember her as both a mentor and a friend. “Marta stood out to me as a renaissance woman with knowledge that went well beyond her academic training,” says associate professor Carsten Oesterlund. “This spirit lives on in many of her students, and especially her daughter-in-law Nienke, with whom I have worked closely.” Nienke Dosa is professor of child health policy at Upstate Medical University and medical director of the Spina Bifida Clinic there. In 1965, when Marta’s husband, Joseph, passed away, the Syracuse chapter of Beta Phi Mu, the international honor society for library and information science, established a scholarship in his memory and honor. Joseph served as librarian at the University from 1958-1965. When Marta retired, the scholarship was expanded to recognize her as well. The Joseph and Marta Dosa Scholarship fund grants tuition scholarships for exceptional students in graduate library education at Syracuse. The award can make a critical difference for students who otherwise would not be able to finish their studies on time or would have to extend their loans. Her honors include the American Society for Information Science’s Outstanding Information Science Teacher Award in 1986, the University Scholar/Teacher of the Year Award in 1989 from the United Methodist Church and the Alumni Award from the University of Michigan’s School of Information in 1990. The funeral service will be held Saturday, Jan. 17, at 10 a.m. at All Saints Church, 1340 Lancaster Ave. in Syracuse. A private burial will follow at Oakwood Cemetery.